After one full day of saying ‘Thank you..’ to everyone who came to the funeral, we (me and the cousins) decided to go and explore more of our hometown. Let’s just say, it’s our way to ease the mourn. 😀 After careful consideration by looking at each of our zodiac and Chinese Signs as well as asking the local shaman, this time, we decided to visit Mangunan – a so-called fruit garden which offers a stunning view of Yogyakarta from a high-place. Why did I say ‘so-called’? 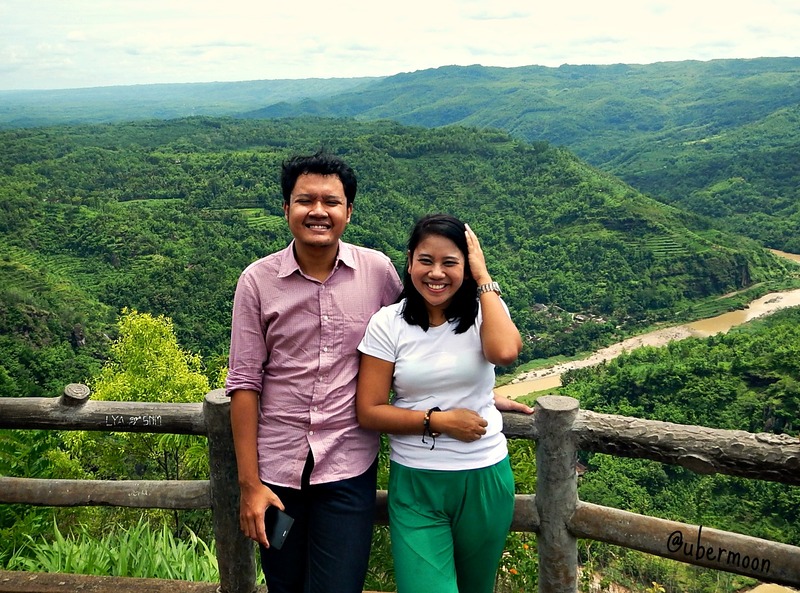 Me et Abang with Oyo River at the back. At the site, there is a limited parking lot available. Another option is to park the car at the parking lot near the ticket counter then walk your way up to the site. I said to my cousins that if I were the one driving the car, I would certainly park the car down and whip everyone to just walk. Easier that way. LOL. We reached Mangunan after around 40minutes drive. It was mid-day and the sun shone spirit-fully. To make things more funny, none of us brought sunglasses, so most of our picture shows our slanted eyes. LOL. Entrance fee of IDR5.000 needs to be paid upon arrival then we’re good to go. The view is breathtaking! In one spot, you can see green hills in afar, in contrast with the blue sky. 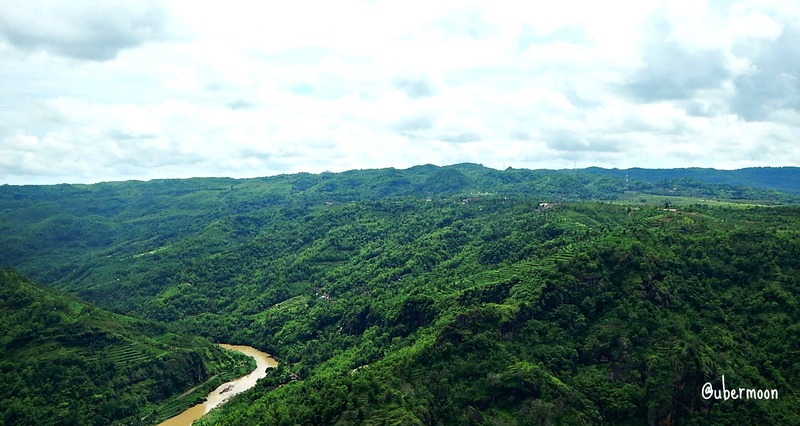 Another viewing spot lets you see the curvaceous Oyo River in the midst of green valleys and a rock formation. It’s a good place to just sit and enjoy the time running slow thinking about why the last relationship needs to come to an end. In a kingdom far far away..
After spending an hour or so in Mangunan, taking pictures and taping a short video, we moved to another site nearby. It’s the Pine Forest. Livin up to its name, it really is just a pine forest. But hey, as a Jakartan, being in a place surrounded by tall trees and breathing fresh air is a trip worth going for. 😛 Moreover, it is only 8minutes from Mangunan, so why not? Spending time going around one tree to another, taking pictures, or just sitting on the bench enjoying time is activity that can be done. The ambiance did make me feel calm and relax. And it is super photogenic also. 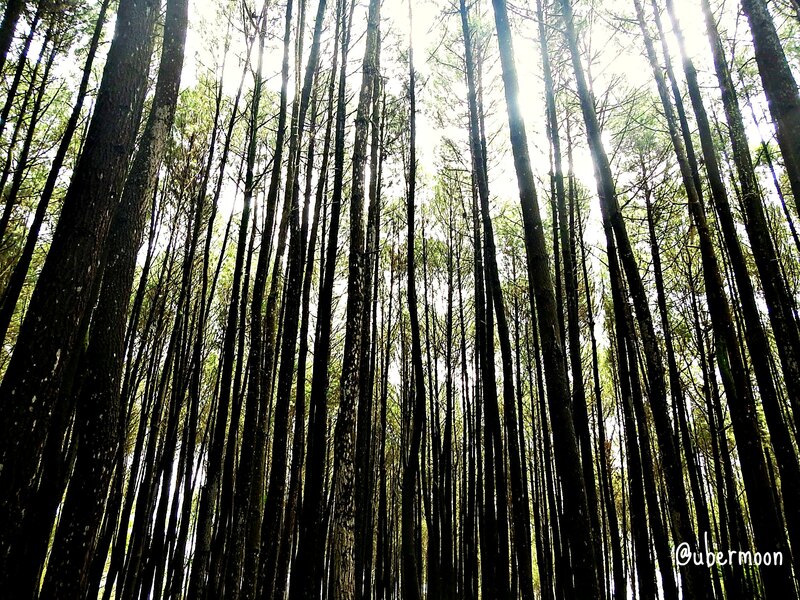 Like, who can guess this picture below is taken in Yogyakarta? We lost track of time when we were there. Busy laughing, chatting, making artsy video (the definition of artsy is us, standing close to each other to fit in the frame, then turning around super slowly while keeping the formation tight – I’ll ask Abang to have the video posted so you guys can see how dysfunctional we were), and getting so close to the tree trunk – checking the bark and guessing the incrustation happened (like we know anything about it). I checked my watch and it showed 3PM already. So starving, we decided to go. Stop by for a while in the mega rock on our way back then we head to eat! It was a nice half-day trip! So refreshing. A great option to go when you’re in Yogyakarta and just want to chill and get closer to nature without having to go far. ← Falling in love with Bali.. EAAAAA!! *screenshot, pajang di kubikel kantor* Hahahaha. Hahaha. Utk traveling Indonesia iya kak, aku coba pake Bahasa Inggris biar mencapai lbh byk org luar dan menarik mrk utk dtg. Utk traveling ke luar, aku pake Bahasa Indonesia. Hehehehe. Dari dulu pingin ke hutan pinus-pinus ini ga jadi jadiiiiii.. Gemes. 1) Turut berdukacita, kak Bul. She will absolutely rest in peace. 3) Eh aku baru tahu ada tempat ini. Fix gue fail jadi pemuda kebangggaan Yogyakarta. 2. Mmmmm nganu, mereka semua adik2 sepupuku. Aku yg tertua. Hahaha. 4. Hehehe. Iya betul sih, masih berusaha nih Kak Nugi jadi emang blm megang lucu2nya. Doakan makin gape ya! Hihihi. It has the most breathtaking view at morning, around 5.30 to 6.30 am. Really?? Whoaaa.. I need to revisit at that time! Hehe. Sebenarnya ini ramai kok. Ya ada 20an orang lebih lah. Ke sini pas awal dulu, Mangunan masih kurang dikenal. Skrg kayaknya sudah lebih ramai ya. Hehehe.